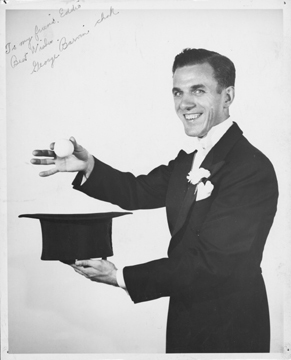 George Barvinchak (1917-1997), who performed as a juggler and magician ("George Barvin") for nearly 60 years, was one of the eight founders of the International Jugglers' Association in 1947. He organized the public show at the first IJA Convention in 1948 at Jamestown, N.Y., and was active in the organization throughout his life, serving as president in 1967. As a sideline to his 45-year career as an engineer, he presented shows throughout western New York state and beyond with props including rings, 5 balls, clubs, plates, and "cannon balls". He was an Honorary Life Member of the IJA. Upon his death in 1997, his family donated some of his props to the IJA archives. 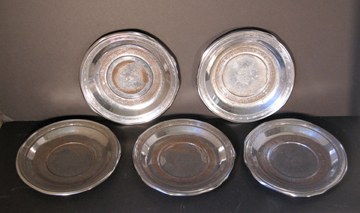 Material: Etched on bottom of plates - "Genuine Chrome Finish - Nickel-Plated Steel". These three sets of juggling balls were used for the "cannonball" juggling gag, in which the juggler first accidentally drops one of the heavy wooden balls, which impresses upon the audience the extreme weight and hardness of the props. Then, after executing a few variations, the juggler makes a high throw and bounces one of the "cannonballs" off his forehead --- the rubber ball, of course --- while simultaneously clacking the other two wooden balls together loudly. Predictably, the audience gasps as the juggler feigns shock and pain, staggering about the stage in a daze. 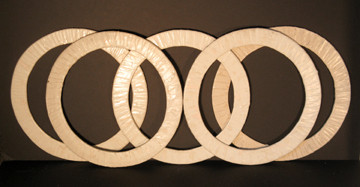 Dimensions: Three sets, one 5" diameter set and two 6" diameter sets. Material: Each of the three sets consisted of two solid wood balls and one matching hollow rubber ball. All were painted with metallic silver paint. Material: Unknown material (but very likely plywood) covered with overlapping white tape.